STORY: The Rumble Fish takes place in the distant future during the 21st century. During the turn of the 21st century, a large-scale natural disaster tears through the eastern side of an unverified country, destroying its economical and political operations and taking a total of 158,000 lives. A prominent corporation in the series, called PROBE-NEXUS, moves its base of operations to the ruined east side and begins reconstructing the area. The rebuilt area flourishes again as it becomes a wealthy and busy city known as Zone Prime, which serves as the backdrop for many locales in the game. In the underground of Zone Prime, PROBE-NEXUS also sponsors a tournament known as the Fight for Survival, or F.F.S., where fighters are gathered from the city's slums and compete for sport. 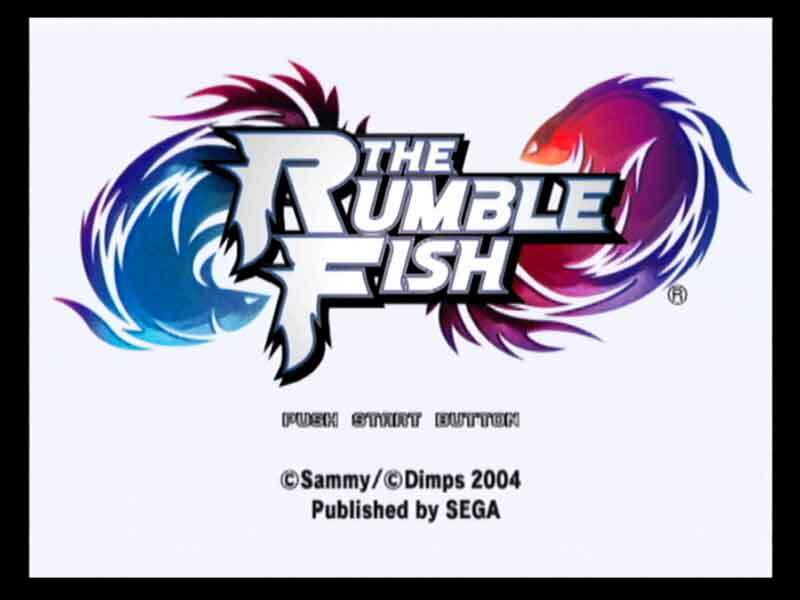 The first Rumble Fish game follows the fifth F.F.S. tournament. Boyd looks like a friendly old man... for the most part. 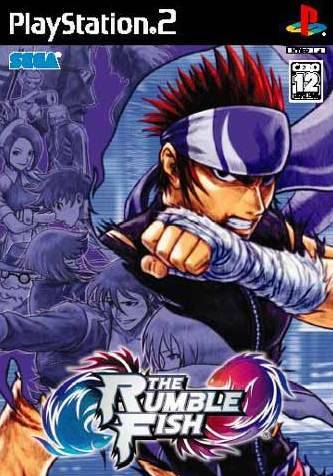 ABOUT: The Rumble Fish is a 2D fighter originally released for the Atomiswave arcade platform in 2004 and was later ported to the PS2 in March 2005. 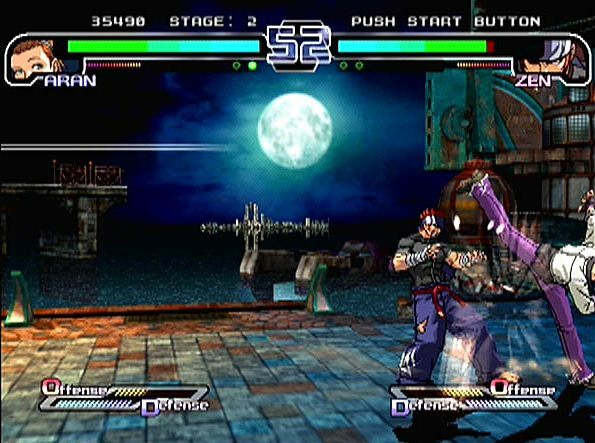 Rumble Fish features 9 characters and uses a 5 button layout (4 attacks and 1 dodge button). 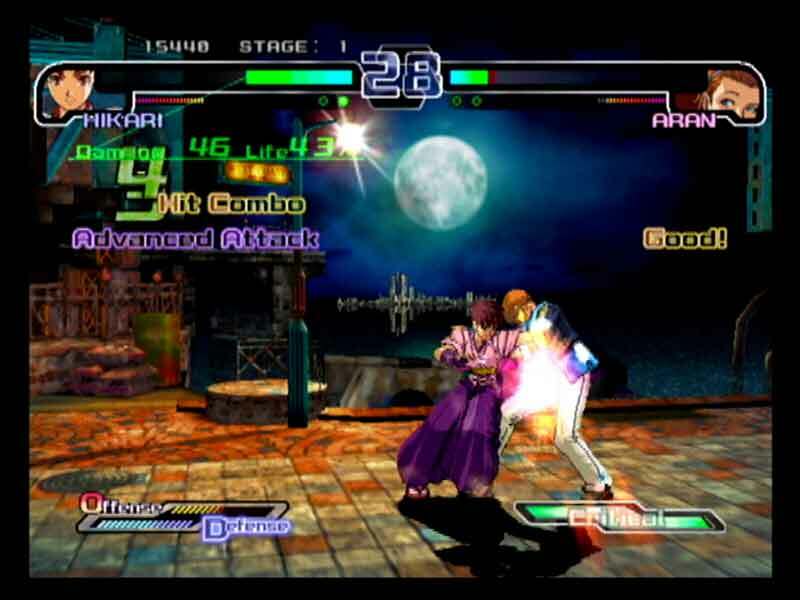 Graphically, the game stands out because of a rendering technique that makes individual segments of the characters body animate separately. 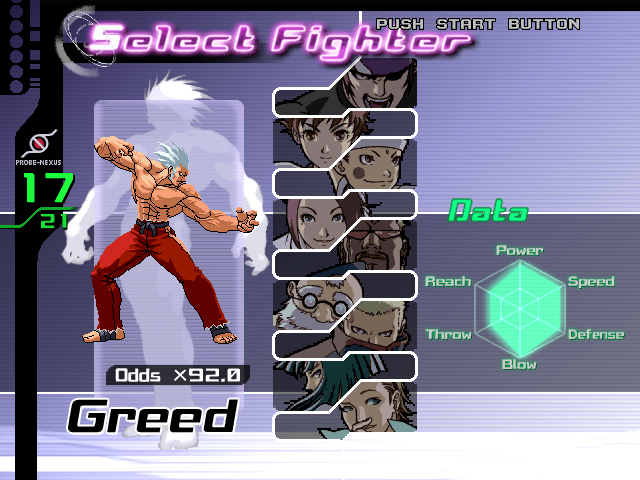 The character sprites are drawn in a high resolution, giving even Guilty Gear X's sprites a run for their money. The characters animate very smoothly for the most part, almost appearing to be 3D. 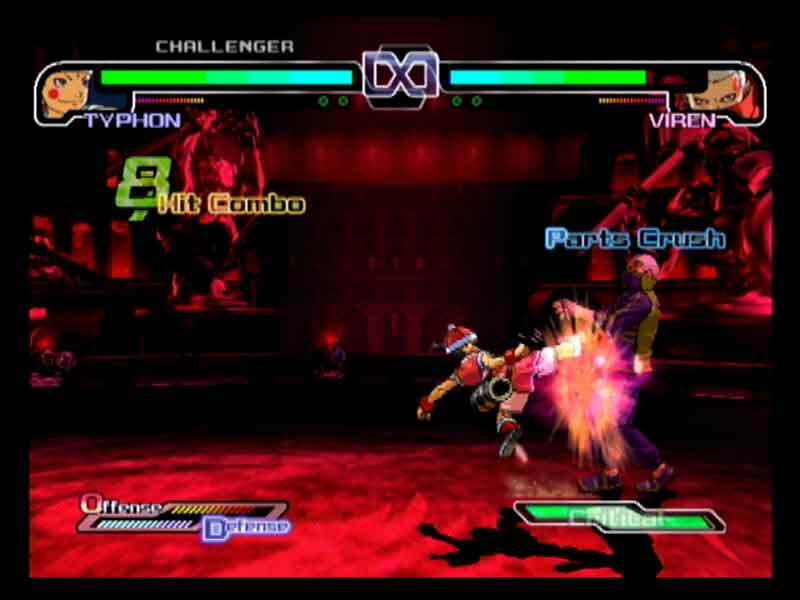 Characters can lose accessories during the fight and their cloths can become ripped. These screenshots hardly do the game justice. 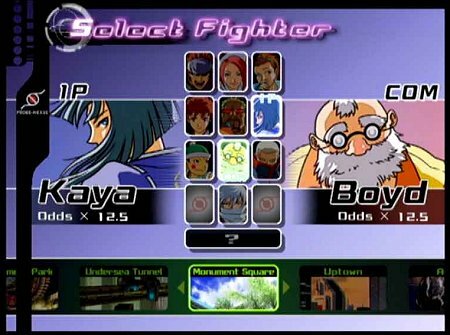 The gameplay system is pretty standard for a 2D fighter, aside from the "block meter" which goes down as you block incoming attacks (formerly used in SFA3), and can result in a guard break. There are also two more meters, one for offense and one for defense. 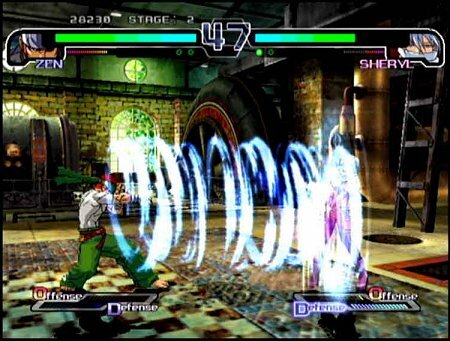 Players can use these meters seperately for super moves or use them both for an "Ultimate Critical Arts Attack." 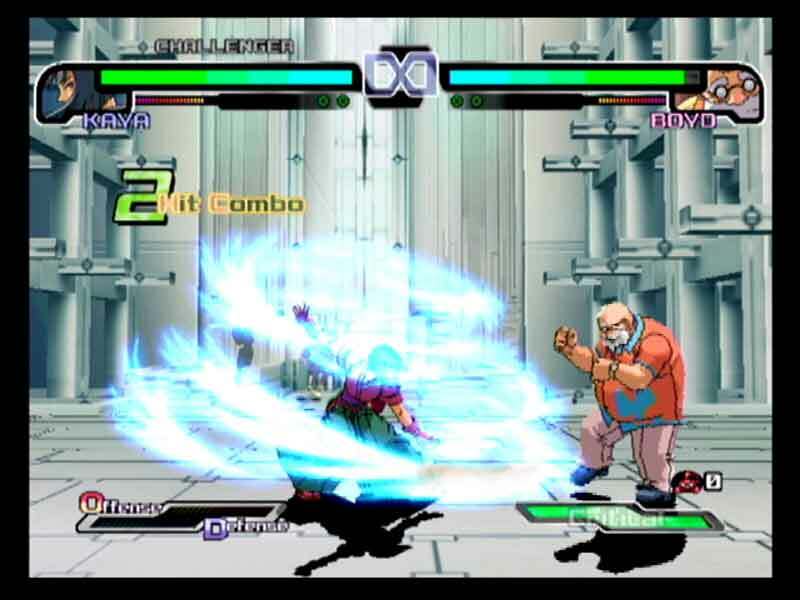 Players can also use their offensive meter for a "Jolt Attack" by hitting LP & LK which makes the screen turn red and allows for a custom combo. I always thought Zen was a cool name for a character. 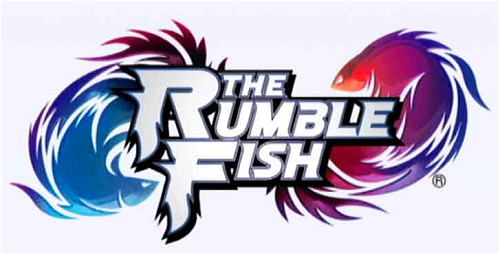 The Rumble Fish is an obscure and not very well-known 2D fighting game. Not much information or artwork is even available for the game (hopefully that will change eventually). From what I've seen, Rumble Fish features an odd, yet interesting cast of characters and seems like a pretty original 2D fighting game. The 2D character sprites definitely have a unique look to them.